Insulin is secreted from pancreatic beta cells in an oscillatory fashion. In his 2001 paper (cited below), James Keener examines a mathematical model for in vitro insulin secretion from pancreatic beta cells in a one-dimensional chemical flow reactor, where the reaction region is represented by the volume occupied by the cells (see the figure below). Glucose enters the cell through GLUT-1 and GLUT-2 transporters. 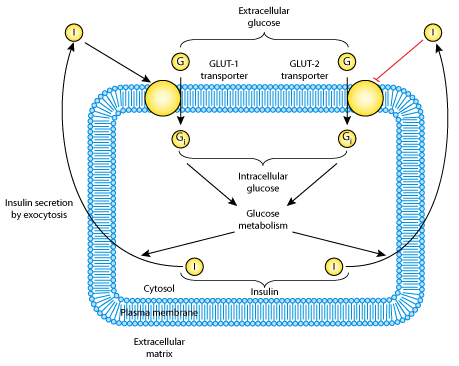 Once inside the cell, intracellular glucose is metabolised, and this process activates insulin secretion via exocytosis of insulin containing granules. In the extracellular medium, insulin activates GLUT-1 transporters and inactivates GLUT-2 transporters. In order to model the reactions, a steady flow of solution along the one-dimensional reactor is assumed, with insulin cells confined to a one-dimensional region. Keener found that the oscillations occur as a result of an important interplay between flow rate of the reactor and insulin diffusion. Without diffusion, the oscillations are eliminated. A schematic diagram representing the model of glucose uptake, glucose metabolism and insulin secretion by pancreatic beta cells. Red lines represent the inactivation of GLUT-2 transporters by extracellular insulin, blue arrows represent the activation of GLUT-1 transporters by extracellular insulin and the activation of insulin secretion by glucose metabolism. Derived from workspace Keener, 2001 at changeset 6c8cc275ab29.